'While exploring the evidence for an afterlife, I witnessed some unbelievable things that are not supposed to be possible in our material world. Yet they were unavoidably and undeniably real. Despite my initial doubt, I came to realize that there are still aspects of Nature which are neither understood or accepted, even though their reality has profound implications for understanding the true breadth of the human psyche and its possible continuity after death. 'So begins Leslie Kean's impeccably researched, page-turning investigation, revealing stunning and wide-ranging evidence suggesting that consciousness survives death. In her groundbreaking second book, she continues her examination of unexplained phenomena that began with her provocative New York Times bestseller UFOs: Generals, Pilots, and Government Officials Go on the Record.Kean explores the most compelling case studies of young children reporting verifiable details from past lives, contemporary mediums who seem to defy the boundaries of the brain and of the physical world, apparitions providing information about their lives on earth, and people who die and then come back to report journeys into another dimension. 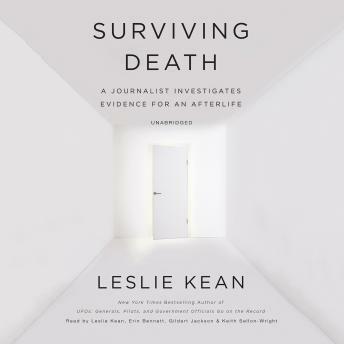 Based on facts and scientific studies, Surviving Death includes fascinating chapters by medical doctors, psychiatrists, and PhDs from four countries.As a seasoned journalist whose work transcends belief systems and ideology, Kean enriches the narrative by including her own unexpected, confounding experiences encountered while she probed the question concerning all of us: Do we survive death?